It has been a wild and crazy ride for many - if not most - people in the asset management industry this year. Maybe your 2018 was shiny, bright, and ridiculously fabulous! Perhaps it was twelve grueling months you can't wait to forget. Regardless of how your trip around the sun went, with the New Year hanging out just around the corner, taking time for a little reflection can be helpful - if not cathartic! In addition to taking stock of the highs and lows of the last twelve months, now is the prime time when many of us also lay out a plan for the future. Whether we are conscious of it or not, most of the plans we make -- personal or professional -- are rooted in our underlying desire to be happier. 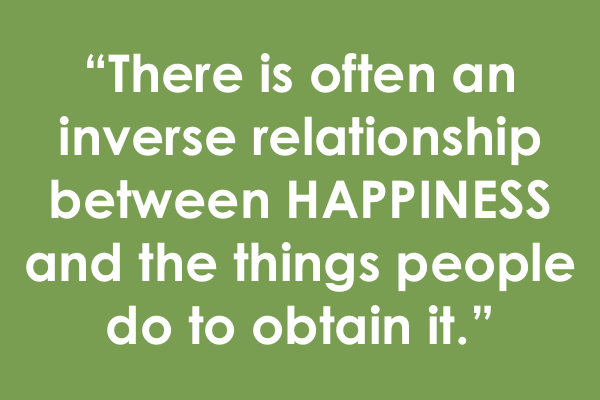 In fact, to me, it seems that the one unifying thread across all human endeavor is the pursuit of happiness. One could reasonably argue that to be happy is THE universal objective shared by all people, from all places, in all times. For all its importance, however, there is often an inverse relationship between happiness and the things we do to obtain it. Every time I sit down to reflect and think through my plans for the coming year, I recall a story told by Benjamin Franklin about paying too much for a whistle. I know this sounds ridiculous but keep reading and it will make more sense a few paragraphs from now. Franklin's story helps me level-set, recalibrate my perspective, and focus on two simple questions; the answers to which have a direct and immediate effect on my happiness. Will accomplishing X, Y, or Z lead to a happier me? If the answer to question number one is "no," why in the world am I wasting my time thinking about it? I find that most of the unhappy people I meet have become so by neglect of Franklin's caution to not give too much for their whistles. I can certainly point to several times in my life where this has been the case! As you're thinking about your plans for 2019 and beyond, I hope Franklin's story as told below strikes a chord with you the way it does for me. And, more importantly, on behalf of everyone at Imagineer, I hope your plans - and their execution - bring you happiness and prosperity in the year to come. When I was a child of seven years old, my friends on a holiday, filled my pocket with coppers. I went directly to a shop where they sold toys for children and being charmed with the sound of a whistle that I met by the way in the hands of another boy, I voluntarily offered and gave all my money for one. I then came home and went whistling all over the house, much pleased with my whistle, but disturbing all the family. My brothers, sisters, and cousins, understanding the bargain I had made, told me I had given four times as much for it as it was worth; put me in mind what good things I might have bought with the rest of the money; and laughed at me so much for my folly, that I cried with vexation; and the reflection gave me more chagrin than the whistle gave me pleasure. This, however, was afterward of use to me, the impression continuing on my mind; so that often, when I was tempted to buy some unnecessary thing, I said to myself, "Don’t give too much for the whistle;" and I have saved my money. As I grew up, came into the world, and observe the actions of men, I thought I met with many, very many, who gave too much for the whistle. When I saw one too ambitious of court favor, sacrificing his time in attendance on levees, his repose, his liberty, his virtue, and perhaps his friends to attain it, I have said to myself; this man gives too much for his whistle. If I knew a miser, who gave up every kind of comfortable living, all the pleasure of doing good to others, all the esteem of his fellow citizens, and the joys of benevolent friendship, for the sake of accumulating wealth, poor man, said I, you paid too much for your whistle. When I met a man of pleasure, sacrificing every laudable improvement of the mind, or his fortune, to mere corporeal sensations, and ruining his health in their pursuit, mistaken man, said I, you are providing pain for yourself, instead of pleasure; you give too much for your whistle. If I see one fond of appearance, or fine clothes, fine houses, fine furniture, fine equipages, all above his fortune, for which he contracts debts, and ends his career in a prison, alas, say I, he has paid dear, very dear, for his whistle. When I see a beautiful, sweet-tempered girl married to an ill-natured brute of a husband, what a pity, say I, that she should pay so much for a whistle. 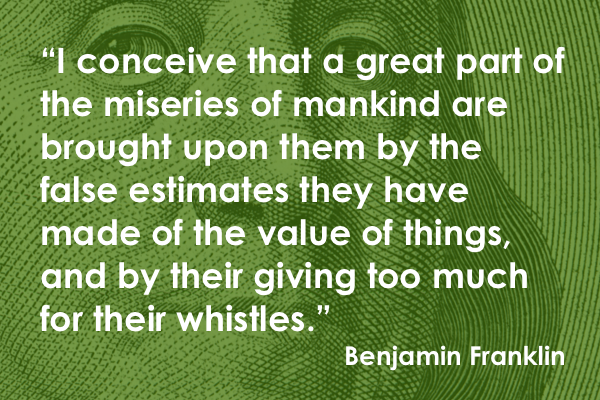 In short, I conceive that a great part of the miseries of mankind are brought upon them by the false estimates they have made of the value of things, and by their giving too much for their whistles. Yet I ought to have charity for these unhappy people, when I consider that, with all this wisdom of which I am boasting, there are certain things in the world so tempting, for example, the apples of King John, which happily or not to be bought; for if they were put to sale by auction, I might very easily be lead to ruin myself in the purchase, and find that I had once more given too much for the whistle! I transcribed this story from one of my all-time favorite books, "The art of Virtue," edited by George Rogers.